This was an interesting question in today’s hangout with John Mueller. Someone asked about the potential impact of an affiliate/advertising link that was placed inside of a form tag as a user action, and whether this could be a problem from a link perspective. 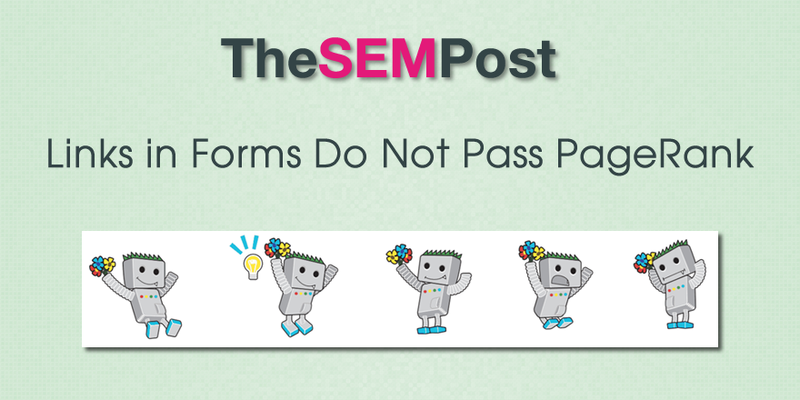 Now links inside forms cannot have a nofollow attribute attached to them, and while they are not a link per se, we do know that Google does use non-linked URLs for page discovery. But what about the special case scenario of links in forms. That’s an interesting question, from what I’ve seen on our side, is that we use these kind of use these form links as way to discover new URLs, not as a way to forward PageRank. So that’s something where you wouldn’t need to nofollow those specific form links. As far as I know, you can’t really set a rel=nofollow attribute to a form anyway, so that’s something where probably it wouldn’t make that much sense. That said, if you really want to kind of isolate that out, maybe that makes sense to put it in an iframe, and then just robot the iframe out to really kind of keep that away. If you’re using these form links as a way to essentially kind of replace a normal static link, it maybe just makes sense to show a normal static link instead. Of course, if you are using the form to actually send some information to the other site, like maybe a form that people need to fill out, then that’s not something you can easily replace with a static link. But in general, this isn’t something where you’d need to put a nofollow on those form links. Well, it’s not really a link but form actions. This is an interesting scenario for those who might be concerned about the use of links in a site. And of course, it doesn’t stop the destination site from disavowing pages with these types of form links on it either. If you do go the iframe route out of caution, remember then that any content within the iframe wouldn’t be indexed, so keep that in mind when designing and creating content for the page you will place the non-indexed iframe on. A link passing PageRank and causing a loss of PageRank are not the same thing. It’s been known that nofollow links don’t pass, but they do lose PageRank. My guess is form links do the same thing. I’m always more concerned about the PR loss than the pass.